This story originally appeared in the Mankato Free Press newspaper from reporter Dan Greenwood. For residents of Henderson, flooding is somewhat of a regular occurrence, so they take it in stride. Three out of the four roads that go in and out of town are closed due to flooding around this scenic town on the Minnesota River, meaning there's only one way out going West on Highway 19. Three roads leading into town, including MN-93, MN-19 and County Road 6, were closed. For commuters like James Brenno, that adds on an extra 30 minutes of driving to get to his job in the Twin Cities. "You go out about 5 miles west and then you can loop back around to 169, kind of like a square," he said. "If you know the back roads there are some savvy locals that know how to get around." For locals who've lived in Henderson for a long time, the inconvenience caused by flooding is nothing new. "Hearing from people that live here, it almost becomes humorous with the news coverage because it happens 2-3 times a year," said Danny Ross, general manager of the Henderson Roadhaus. It's a popular spot for the hundreds of motorcycle enthusiasts who make the pilgrimage from the Twin Cities Metro Area, Mankato and elsewhere to this quaint, picturesque town of 917 people. The Minnesota River Valley Scenic Byway is a popular route for tourists, but the flooding has closed the road, making it tricky to get into Henderson for out-of-towners. "With the nice weather yesterday, had the road been open, there would have probably been another 50 bikes," Ross said. "It has a really big impact on the weekends." Fortunately for Ross, locals make an extra effort to eat at the restaurant during spring flooding. "People we don't see often — all of a sudden they'll make it a point to come in because they know it's a slower time." But a few visitors went out of their way to come to Henderson, despite the detour. Sunday morning, a couple came in for breakfast from Mankato, and Saturday a party of 12 people from New Ulm and Minneapolis stuck with the original plan of having a birthday celebration there despite the longer drive. For the vendors that supply the Roadhaus with food, beverages and other products, it can take nearly twice as long to bring in supplies, especially for drivers who aren't familiar with the country roads. "It's a lot of aggravation," Ross said. "All those different companies struggle to find their way here." On the edge of town, Highway 93 is blocked by a large steel wall and sandbags to prevent the flooded road from reaching the nearby houses. 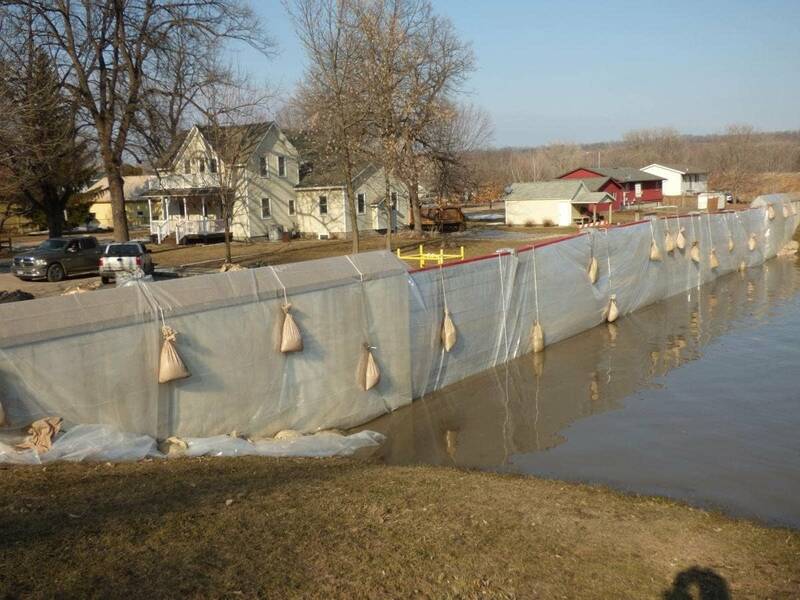 Marry Menne, whose married to Henderson Mayor Paul Menne, said it's one of two walls constructed by volunteers to prevent the flooding from spreading into town. Designed by the Army Corps of Engineers, the local fire department put the word out that the river would be cresting and they needed volunteers to put up the wall fast. This is not the first time the community came together to mitigate the flooding with a wall, and it probably won't be the last. "When you're available you come help. It's kind of a stinky job when you take it down because it's really muddy and wet," Mary Menne said. "But everyone helps out; there were over 35 people." Menne's friend Meghan Graham lives within eyesight of the wall, she and Menne were talking about the increasing frequency of the city preparing for flooding and road closures. "These are steel barriers and they slide them into place," Graham said. "The barriers are used year after year. The concrete dividers are permanently in place and they come right out of the levy." Ross hopes the attention the town is getting from the flooding will lead to action. He said there's been a lot of talk about one of the roads so even if it does flood, there would be more than one way in and out of town. One positive is that because Highway 93 runs through town and is a major commerce route, the community hasn't been able to close the main thoroughfare for one of its festivals. With the road closed, the Minnesota Department of Transportation gave town permission to have a street festival. "We're going to throw a flood party on April 5," he said. "Four local bands will be playing, there will be a petting zoo. The mayor reached out to Gov. Tim Walz to come and see the impact when the roads are closed and what it's like to get here." Mary Menne said the flood party is a way to show visitors how difficult it is to have only one road that goes in and out of town. "Every year we try to get funding for the roads, when it's not imminent it's hard for people to understand what it really looks like," Mary Menne said. "For the school buses, it's half hour extra for a school district that's on the opposite side of the river to get everyone where they need to go. A lot of people commute to the cities. We're hoping for the festival that a lot of fellas and ladies come in and see that it is important to make sure there is more than one way out." Two state lawmakers that represent the area, Rep. Glenn Gruenhager and State Senator Scott Newman, have introduced two proposals to secure $18 million in funding to raise the Scenic Byway to mitigate against flooding and provide a second way into and out of Henderson. "We're in the process of trying to raise awareness that those are both active and getting them to move forward," Mayor Paul Menne said. 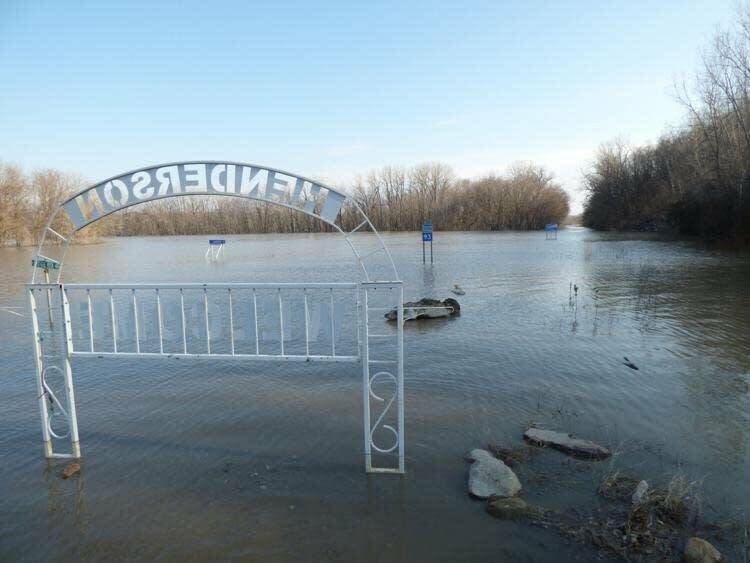 According to National Weather Service, the Minnesota River at Henderson crested at 738 feet on Sunday, just a couple feet shy of the 2010 record of over 740 feet. River measurements at St. Peter Sunday was 737 feet and in Mankato crested Friday at 26 feet.